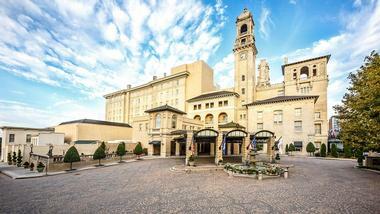 Located in the heart of downtown Richmond and a great weekend getaway from Washington, DC, The Jefferson is a luxurious hotel that offers beautifully appointed accommodations, fine dining, extensive amenities and superior service. 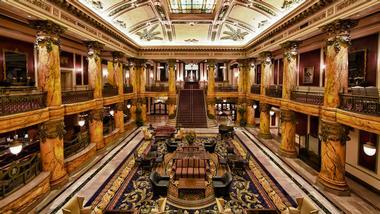 A charter member of Historic Hotels of America, this National Historic Landmark hotel has a world-renowned reputation for luxury and grandeur and has played host to high-end patrons, including Theodore Roosevelt, Woodrow Wilson, Franklin D Roosevelt, and Elvis Presley. Ideally placed for exploring the beauty of Richmond and Charlottesville, The Jefferson promises an unforgettable Virginian experience. 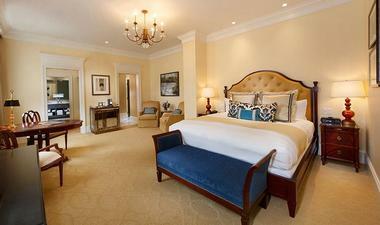 The Jefferson features beautifully appointed guest rooms and suites furnished with contemporary décor, private en-suite bathrooms and large windows with lovely city views. Modern amenities abound in every room and include flat-screen televisions with premium cable channels and on-command movies, multiple dual-line telephones with voice mail services, fully stocked minibars, Nespresso coffee makers, iron and ironing boards, plush bathrobes and Molton Brown bath products. Additional guest services at no extra charge include an evening turndown service, free local telephone calls, morning newspaper delivery, a car service to any destination in the downtown area and wireless high-speed Internet access. Guests also have complimentary access to the fitness center and indoor swimming pool. Newly renovated Premier Rooms range from 400-500 square feet and feature king-size beds with deluxe mattress sets, luxury bed linens, soft pillows and plush throws, and en-suite bathrooms with separate showers and soaking tubs, double vanities, oversized bath sheets, plush bathrobes, and Molton Brown bath products. Dressing areas have lighted make-up mirrors, comfortable chairs and access to iron and ironing boards. Spacious sitting areas have overstuffed armchairs and ottomans for relaxing, flat screen televisions with premium cable channels and on-command movies, fully stocked minibars packed with locally-made snacks and a Nespresso coffee maker with gourmet teas and coffees. A large desk with ergonomic chair offers a neat workspace with multiple dual-line telephones with complimentary local phone calls and wireless high-speed Internet access. Additional guest services include an evening turndown service, daily housekeeping, same-day laundry and dry cleaning services, an overnight shoe shine, and a weekday newspaper delivery. The largest of the guest rooms, the Grand Premier Rooms are newly renovated and decorated with beautiful draperies, custom woven carpets, antique reproduction furnishings and locally inspired artwork. Ranging from 500-600 square feet, Grand Premier Rooms feature either one king bed or two queen-size beds with deluxe mattress sets, luxury bed linens, soft pillows and plush throws, and en-suite bathrooms with separate showers and soaking tubs, double vanities, oversized bath sheets, plush bathrobes, and Molton Brown bath products. A comfortable seating area has a table and chairs for dining or working, and modern amenities include flat-screen televisions with premium cable channels and on-command movies, multiple dual-line telephones with voice mail services, fully stocked minibars, Nespresso coffee makers, iron and ironing boards. Additional guest services include an evening turndown service, daily housekeeping, same-day laundry and dry cleaning services, an overnight shoe shine, and a weekday newspaper delivery. New to the hotel, the Richmond Suites are 700 square feet in size and feature king-size beds with deluxe mattress sets, luxury bed linens, soft pillows and plush throws, and en-suite bathrooms with separate showers and soaking tubs, double vanities, oversized bath sheets, plush bathrobes, and Molton Brown bath products. Dressing areas have lighted make-up mirrors, comfortable chairs and access to iron and ironing boards, and a guest toilet is located off the sitting area. Spacious sitting areas have overstuffed armchairs and ottomans for relaxing, flat screen televisions with premium cable channels and on-command movies, fully stocked minibars packed with locally-made snacks and a Nespresso coffee maker with gourmet teas and coffees. A large desk with ergonomic chair offers a neat workspace with multiple dual-line telephones with complimentary local phone calls and wireless high-speed Internet access. Additional guest services include an evening turndown service, daily housekeeping, same-day laundry and dry cleaning services, an overnight shoe shine, and a weekday newspaper delivery. Named after The Jefferson’s founder, Major Lewis Ginter, Ginter Suites are 1,100 - 1,200 square feet and have welcoming foyers, separate bedrooms, spacious living rooms and a fully-equipped kitchenette. The Master bedrooms feature king-size beds with deluxe mattress sets, luxury bed linens, soft pillows and plush throws and comfortable arm chairs, and master en-suite bathrooms with separate showers and soaking tubs, double vanities, oversized bath sheets, plush bathrobes, and Molton Brown bath products. Spacious sitting areas have overstuffed armchairs and ottomans for relaxing, flat screen televisions with premium cable channels and on-command movies, fully stocked minibars packed with locally-made snacks and a Nespresso coffee maker with gourmet teas and coffees. A large desk with ergonomic chair offers a neat workspace with multiple dual-line telephones with complimentary local phone calls and wireless high-speed Internet access. Fully equipped kitchenettes offer refrigerators, sinks, wine racks, and coffee makers and a dining and chairs can seat up to six people. Additional guest services include an evening turndown service, daily housekeeping, same-day laundry and dry cleaning services, an overnight shoe shine, and a weekday newspaper delivery. 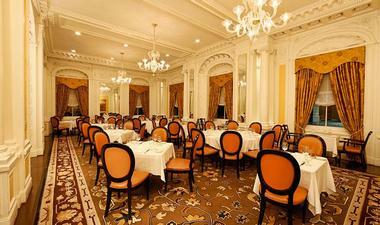 The Jefferson Hotel presents four distinctive dining options - Lemaire Restaurant, TJ's Restaurant and Lounge, Afternoon Tea, and Sunday Brunch – each offering a unique dining experience. Lemaire is a New American eatery that serves a menu of creative dishes made from Virginia-grown ingredients and presented with Southern flair. Guests can savor the exciting menu in the elegant dining room followed by after-dinner drinks in the comfortable lounge or on the outdoor patio. An innovative cocktail list of handcrafted cocktails and classic libations, including a wine list with over 200 New and Old World labels. TJ's is a Southern-style bistro that serves globally influenced Southern cuisine in a casual atmosphere. Ideal for a mid-week breakfast, lunch with friends, or post-work drinks with colleagues. The menu features a range of dishes that include locally sourced vegetables and salads, naturally raised meats and sustainably harvested seafood accompanied by a comprehensive list of beer from Virginia breweries, Old, and New World wines and imported spirits. TJ's has an inviting lounge that offers a casual ambiance in which to enjoy specialty cocktails or craft beers with friends while watching the game. Enjoy a traditional afternoon tea at The Jefferson with their famous Southern Afternoon Tea, which is served Friday through Sunday. Tuck into freshly baked scones and pastries, small finger sandwiches and an array of local and imported teas under the magnificent Tiffany stained glass ceiling of the Palm Court. Another favorite at The Jefferson is the Sunday Champagne Brunch, which brings to mind a bygone era of grand buffets and lavish feasts. Served in the beautiful Rotunda lobby with its magnificent marble columns, the brunch menu features an array of dishes and plates created from Virginia’s best seasonal ingredients, taste, and flavors and served with the background music of the Randall Pharr Trio. Salon Vivace provides a tranquil refuge for guests to be pampered and preened with various massage therapies and body treatments, including therapeutic, specialty and Swedish massages and hot stone treatments. A unique and personalized menu of massages, body treatments, facials, skin care and other salon services are available to be enjoyed in the spa’s tranquil on-site treatment rooms or in the comfort and privacy of guest rooms or suites. 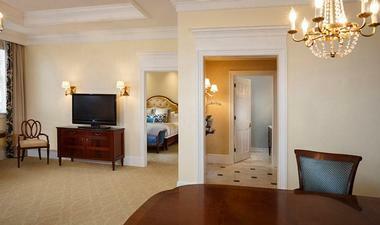 The Jefferson offers an array of amenities and activities for guests to enjoy. Explore the downtown district surrounding the hotel on one of the hotel's six classic Dutch bicycles, that come complete with helmets, combination locks, and baskets. A modern business center is located in President's Hall and offers business travelers a variety of amenities and office supplies, including printing, photocopying and facsimile services, notary services, typing and packing and shipping. Rental equipment for meetings is also available, such as laser printers, paper shredders, Polycom sound stations, and laptops. There are also 24-hour computer workstations with computers, black and white printers and high-speed Internet access next to the business center for overnight guests’ use, as well as additional computer workstations in the Palm Court lobby. Concierge services include restaurant reservations, theater and performance ticket purchases, sightseeing and tour information, babysitting services, transportation arrangements, including airline, rental car and Amtrak bookings and complimentary transportation to downtown destinations, floral and gift deliveries, electric car charges (two Tesla and one universal car charger). A state-of-the-art fitness center features up-to-date equipment, including cardiovascular equipment, weight training machinery, and a free weights section, as well as private men's and women's showers and dressing rooms. An indoor swimming pool with outdoor deck is lined with palms and wicker furniture and offers a perfect place to unwind and relax. The Jefferson is a renowned destination for exquisite weddings, receptions, ceremonies and other special occasions, with the legendary Grand Staircase being the perfect backdrop for unforgettable photographs. Wedding and event services include elegant ballrooms that can accommodate up to 450 guests, professional catering managers who execute every detail to specification and create personalized menus, flower arrangement services, spa services, exclusive wedding portraits taken on the Grand Staircase, and complimentary accommodation at the hotel on the wedding night. 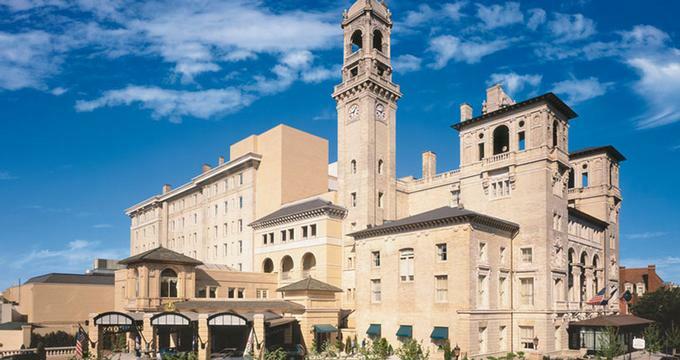 The Jefferson Hotel follows an aggressive recycling and resource conservation program to conserve water and energy on a daily basis. Back to: Weekend Getaways from Washington, DC and Best Things to Do in Richmond.